Those days were gone bias between the permanent residents and Australian citizens. Australia government intention is to bring equality among all, allowing most of the privileges for permanent resident equal to the local citizen. Some of the benefits like education, Medical care, have the right to vote, freedom of living and highly secured life. 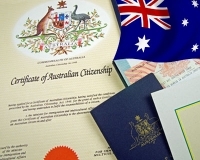 Benefits granted to the PR holding candidates will drive them to Apply for Australian citizenship. The report stated by the Australian Productivity Commission, this equalization will impact on the economic and social structure of the country to improve. This improvement credit not only just goes to the immigrant candidate skills also this is the combination of government norms on immigration, social relations these supports the system and brings equality among all. The government of Australia intention is to increase a maximum of visa holders into local citizens every year; this process goes with many stringent levels make sure the candidate meet the criteria eligible for Australian citizenship.